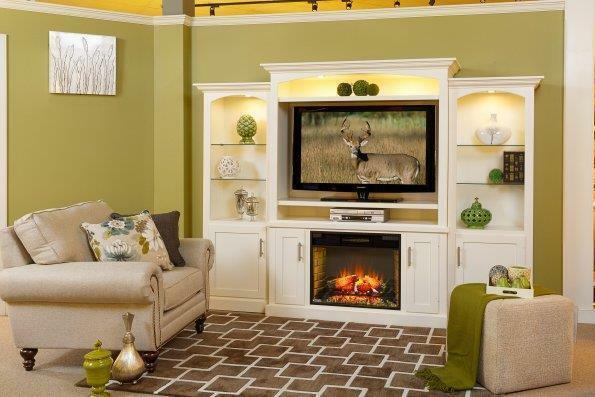 Create the focal point of your living space with our Amish Park Lane Fireplace Entertainment Center. Invest in the very best and enjoy your family's recreation time in front of a warm fire sharing stories and laughs. This gorgeous unit is handcrafted to your specifications in beautiful Lancaster County, Pennsylvania. The clean, expertly crafted lines of your new entertainment center will serve as the perfect frame for your television as well as its built-in fireplace. Cozy up to a truly exceptional piece that will be the workhorse of your living room. The Park Lane can feature up to 4 roomy cabinets, 1 on each side of the fireplace, and 1 built into each of the optional bookcases. Store your books, DVD's, board games, and the like using these ample spaces. The Park Lane strikes the perfect balance between attractive and functional. We love the monochromatic look that is pictured. A lovely combination of greens and taupes makes for a warm look that is as inviting as the fireplace! Allow the color scheme of your living room to be enhanced by this gorgeous piece. 2 built-in glass shelves in each of its side towers will allow you to display all of your treasures with ease. Because this entertainment center is made to order, the sky is truly the limit for creating the unit of your dreams. If you do not see the perfect options for you, please feel free to give us a call at 866-272-6773 to discuss how we can accommodate your needs. We are here to help! Add Bookcases- Set of 2 (can be built with no doors, showing only shelves). Note: Center unit is shipped in 2 separate parts. If bought as shown, a total of 4 parts will be shipped.